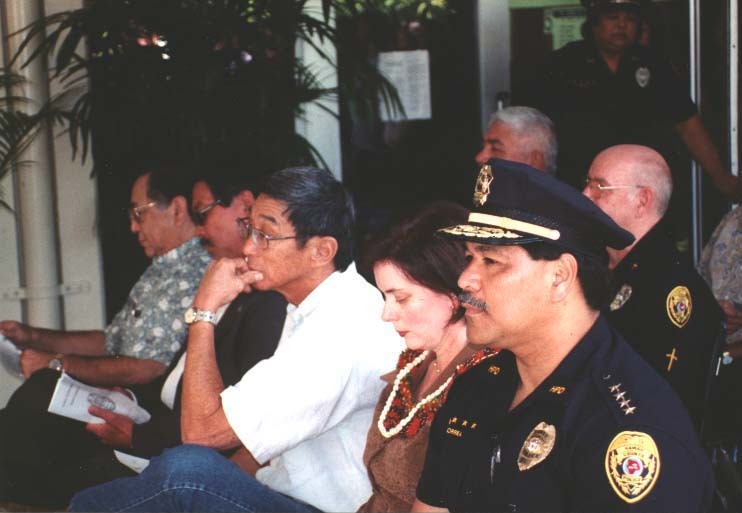 FRONT ROW-Above, Police Chief James S. Correa, at right, his wife, Adeline, Mayor Harry Kim, Police Commission Chairman Wilfred M. Okabe and County Council Chairman James Y. Arakaki watch the swearing-in ceremonies. At left, Chief Correa addresses teh crow of well-wishers attending the swearing-in ceremonies. 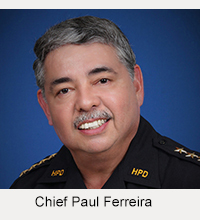 James S. Correa was sworn in as the eighth police chief of Hawaii County during public ceremonies held Thursday (February 1, 2001) on the lanai of the Public Safety Building in Hilo. Mayor Harry Kim swore in Correa, 47, as his wife, Adeline, and son, Officer James K. Correa, stood at his side. Correa, a 26-year veteran, had previously been sworn in during a private ceremony held on January 23, 2001, in the mayor’s office. “I stand here before you today and ceremonially restate my oath. I wear my new shield, ‘Police Chief, Number One,'” Correa said. “This shield shines and is not scratched or dented. This shield comes with a legacy of integrity and devotion to duty which was earned by all police chiefs in law enforcement. 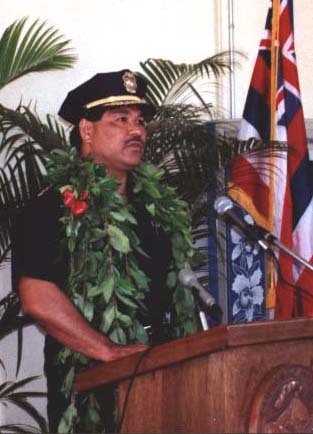 Major Charles M. Chai, head of the Administrative Services Division who acted as master of ceremonies, noted that the Hawaii County Police Department was established in July 1943. Chief George Larson Jr. — 1943 to 1948. Chief Anthony R. Paul — 1948 to 1969. Chief George A.K. Martin — 1969 to 1970. Chief Ernest J. Fergerstrom — 1970 to 1976. Chief Guy A. Paul — 1976 to 1988. Chief Victor V. Vierra — 1988 to 1994. 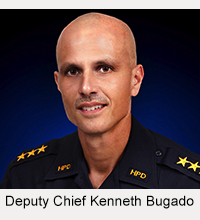 Chief Wayne G. Carvalho — 1994 to 2000.